Over the years, we've treated many. Here's what people say about Dr. Nsouli and his team of specialists. Dr. Nsouli is a leader in research in the medical field, publishing a plethora of research discoveries which leads the medical field in learning more effective and safe techniques. Dr. Nsouli has great knowledge, and is an articulate doctor. Moreover, his passion and intrinsic motivation makes him unique. I would recommend anyone to go see him if they are having any medical health problems (allergic & immune) as his logical skill in developing a treatment strategy is exemplary. It was amazing. His office is well appointed and the staff is more than professional they were engagingly polite. Everything they were going to do was explained results were explained. Dr. Nsouli took a complete history, thorough allergy eval (like 80), examined my sinuses and all the while and this is why I am taking the time to write. Dr. Nsouli and staff made me feel as if I was the only patient they were seeing. In less than an hour. Made my day!!! Excellent care by Dr Nsouli! I've been to many other offices but never received that much attention and care, especially during initial consultation. Dr. Nsouli is very knowledgeable and has an excellent connection with patients. He's very friendly with great sense of humor which made me feel welcomed. 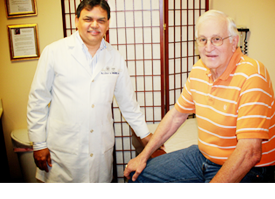 His comprehensive treatment is very effective which was a great relieve, specifically after not being helped at other clinics. Highly recommended. I highly recommend Dr. Nsouli. His office provides patients with an outstanding, comprehensive experience for allergy care. I've already recommended him to several friends who also suffer from allergies. Office staff are pleasant and helpful. Dr. Nsouli took the time to listen and evaluate my complaints and to ensure that I understood what was going on and why we he was recommending a particular course of treatment. In addition, Dr. Nsouli's office was well equipped with medical equipment which provided a streamlined and efficient experience. It's very clear that Dr. Nsouli is very knowledgable and engaged in the latest medical research in this practice area and this translates in the quality of care he provides patients. I have only seen Dr. Nsouli a few times himself but he really got me started on the first healthy route to treat my allergies in decades! His staff and team of RNs and PAs are very accommodating as well. Obviously they are only open business hours, which makes it hard to get in sometimes, but that's how a Doctor's office works. My allergies have never been more under control now than ever before. Thanks!